Coast Outdoor donates used vinyl billboards to Jollity Farm on Thetis Island. Turns out used vinyl billboards are great for weed control and re-use around a farm. Who knew? We're happy that they're not going in the landfill. Jollity Farm is a ten acre non-certified organic farm on Thetis Island operated by two fledgling farmers, Noah and Elisabeth Bond. Noah and Elisabeth are self-taught farmers who are learning by growing food for their small island community. Jollity Farm practices organic, permaculture and biodynamic farming methods. 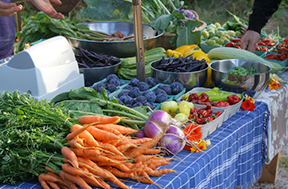 The main focus of the farm is providing a CSA (community supported agriculture) box program to island residents. Thetis Island is a rural southern gulf island with no stores or commercial spaces to provide fresh, local produce. The Bonds saw a need for a community supported farm and greater food security on their new island home and in the five years since they have moved to Thetis Island, they have taken over the old Vineyard and converted the property into a thriving agricultural hub. In the second year of full time growing, the farm is able to share a bountiful supply of fresh produce and heritage breed pork to islanders. Farming for a small community isn't the most lucrative undertaking, but a labour of love and passion for food security, sustainable land use and fresh local food. Noah and Elisabeth are outspoken advocates of local farming and food production and operate the Get Fresh Guide in addition to the running of their farm. There are many hopes and dreams for the future of small farms and it does indeed take a community to support and share in the future of their own food and land security. How do used billboard vinyls benefit the farm and the community? They're used to protect valuable top soil in winter to avoid erosion, smother pathways between raised beds to suppress weeds, cover compost piles to help raise the heat and bring compost piles to correct temperatures, cover beds when cover crops have been applied to stop birds eating all the seeds and keep straw and hay clean and dry for the animals that live on the farm. Connect with the growers, providers, supporters and producers of local food at getfreshguide.com.